A Road Diet is when the overall width, lane width, or number of lanes on a road is reduced. The goal of the Road Diet is to reduce the speed of traffic and improve safety and or capacity for pedestrians and cyclists. There are many streets in Providence that need to go on diets, and we will profile some of them here. The first one I’d like to show is Thomas Street. 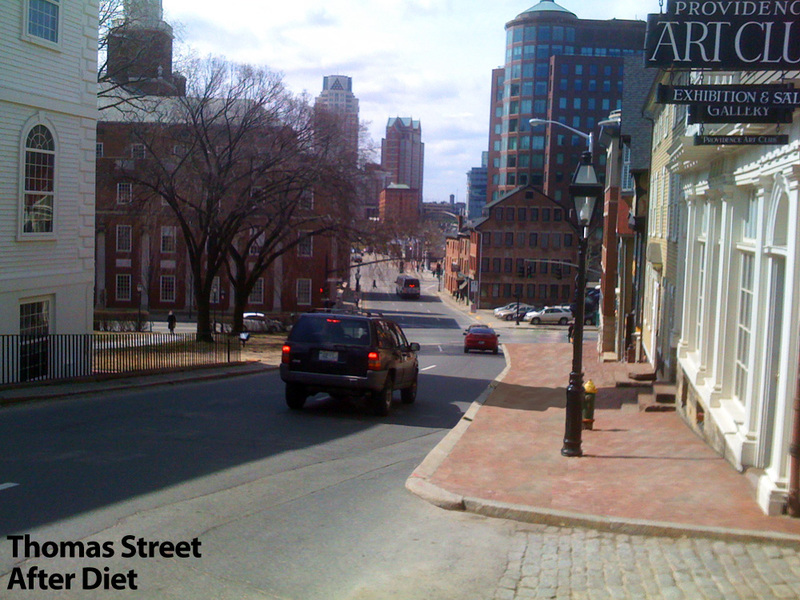 Thomas Street runs between Benefit Street and North Main Street, connecting Angell Street to Steeple Street. Currently Thomas Street is set up to have up to three lanes, the lanes are rather wide, and there is a right turn lane at the bottom of the street onto North Main. As a result of the wide lane width and number of lanes, traffic tends to move at a very high rate of speed down Thomas Street. Recently a car went through the front of the Providence Art Club taking a street light down along the way. The sidewalks on either side of Thomas Street are very narrow, the sidewalk on the Baptist Church Street side is only wide enough for one person (when two people pass, one has to step into the street). On the Art Club side, the sidewalk is wider, however steps into buildings and streetlights and fire hydrants and the like make the effective width of the sidewalk similar to that on the other side (i.e. very narrow). At the bottom of the hill, the radius of the right turn lane means that traffic tends to roll through the right turn, not yielding to pedestrians trying to cross North Main. Often drivers only look left while rolling through the right turn, never looking right to see if there are any pedestrians. Remove the right turn lane and shallow radius, force traffic to stop before making a right angle turn and drivers will be forced to be more aware of their surroundings, including pedestrians when turning. As shown in the images above, putting the road on a diet reduces the width of the road where it meets North Main Street. Reducing the road width reduces the gap that pedestrians need to cross. A northbound pedestrian no longer has to fear a car speeding down the street and sliding through that third lane right turn without stopping or looking (as often happens now). Putting Thomas Street on a diet gives more room and more safety to pedestrians without a large hit to traffic capacity. The impact on traffic is to basically slow it, and in practice traffic is mostly going as fast as it can down the hill to get to a red light (behavior you’ll see all over the city). I have to disagree on this. I think that intersection is safe as a driver, pedestrian, and cyclist. It’s a really -busy- intersection between peds, bikes, and cars, not to mention that it’s at the bottom of a steep hill, so a little bit of anxiety is totally to be expected there. Also, the lights in this city don’t time-up properly, which is why people are always racing to get to the next one before it changes. If you weren’t sitting in your car at a red light staring at the next intersection’s green light for fifteen seconds(and you know it won’t stay green forever) when your light turns green, you’re going to try to ‘make it’. I’m actually -really- disappointed by the ‘road diet’ job done on Hope Street (near the boulevard) a few years ago. The idea was to make the roads more narrow and the sidewalk wider in some spots to slow traffic, but all it does is force me to bike right into the ‘car zone’ (where the cars are still going full-speed). I sort of botched the grammar towards the end of the first paragraph, sorry folks, it’s late! I have to disagree here too. It’s a very, very busy intersection. Not only would narrowing the street do little to relieve the stress on cyclists and pedestrians for the reasons that Marc stated above, but it would cause traffic to regularly back up far through the intersection of Angell and Benefit, which would then cause traffic to back up on Benefit, and probably on Waterman as well. I would suggest saving the diet for another street — one that slopes less precipitously — where the additional sidewalk width could be more usefully employed for cafe seating and/or other “street life” activities. Hard to set up a chair on Thomas Street without it tipping over! This street already has a rather wide sidewalk. A better idea would be to use the road space you intend to take over with brick sidewalk as a bike lane. It looks like there would even be room to have a curb-enclosed bike lane – adding safety for cyclists and keeping parked cars out of the bike lane. 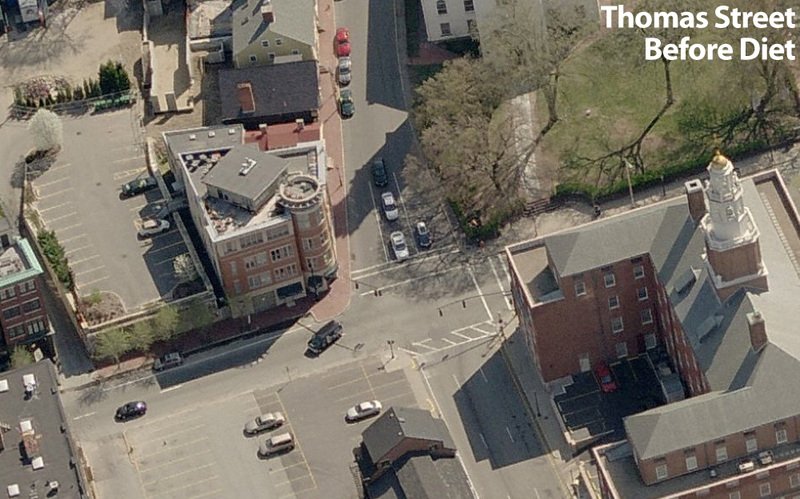 Traffic volume on Thomas approaching N. Main is barely greater than the volume on Angell approaching Benefit, which is now 2 lanes into an intersection where pedestrians also conflict often with turning traffic. There is no reason to expect the proposed diet to worsen the backup approaching N. Main. Volume is already limited upstream. The bike lane is interesting but since it would only connect to rather nasty cycling at either end of Thomas Street, it should go there only if it were part of a wider plan to collect downtown bike traffic. Whenever I am cycling through that area I try to use College street – much mellower to, through and from. I am tired of bike facilities being sited where they are easy to implement but essentially not necessary (like Blackstone Blvd) instead of where conditions are so daunting as to discourage people from choosing to ride to the places they actually need to go every day, like work. If the north side is considered wide enough, what about reducing the opposite side of the street then? That asphalt goat track alongside the First Baptist is a nightmare. I almost never drive this route, so that might explain why I am more in favor of any change that reduces speeds and traffic through here, and why I don’t share the opinion of other commentators that these intersections work as already configured. The loss of the traffic island at the corner of Thomas with Benefit has added considerably more danger to my walk home, and as mentioned in the posting, rolling stops at the bottom of the hill have always made crossing there a roll of the dice. Perhaps a diet isn’t the answer, but what would work better? I definitely agree with Jef, though, that there is a lot of “racing” to beat the lights here, but I’ve always thought of this (and all of the nearby blocking of boxes that happen) as less outgrowths of bad intersection design than of incomprehensively bad coordination of traffic lights in that entire area. In fact, all of the light timing of East->West traffic flow from Wayland Square through to Francis Street is mind-bogglingly bad. Is Thomas Street most in need of a diet? Certainly not, but I walk down it almost every day and ride in cars down it almost everyday, so I think a lot about how much I hate it, so that’s why I started with dieting here. Ben, I have to seriously disagree about the sidewalks being wide enough, the sidewalk on the church side is almost a balancing beam. The sidewalk on the Art Club side may be of average width (though I think our average sidewalk width in Providence is not enough) but with street lights, fire hydrants, and the steps from buildings impeding the sidewalk, the effective width is vanishingly small. I’m giving up on the church street side and wanting to see a wider sidewalk on the Art Club side. Several have mentioned a bike lane, and I agree, both Angell and Waterman should have bike lanes clear across to the Henderson Bridge. I think if bike lanes are installed on these streets, they should be on the left side. Parking should remain on the right and the bike lane should be on the left to keep bikes out of the door zone. Most of Waterman and Angell are effectively one lane wide, the extra lane width should be turned into a bike lane. Andrew points out that dumping a bike lane into the North Main / Steeple / Washington mixing bowl is not ideal. I agree but think we have to start somewhere, let’s get the bikelanes built and deal with the mixing bowl mess as we can. Alternately, as Andrew suggests, the bikelanes could go to College Street via Prospect to avoid the whole mess at the bottom of the hill. But, I’m digressing on bike lanes. The crux of what bothers me about Thomas Street is the right turn lane. While Marc and Corey are concerned about traffic backing up onto Benefit if the Right turn lane were removed, I don’t think this would be as much of a problem as they fear, and I think acquiescing to the problem is making concessions to bad behavior. The reason the Washington / North Main / Steeple mixing bowl is such a mess, is no one has any respect for the box; and Marc speaks to one of the reasons why, signal timing. While the signal timing contributes to bad driver behavior, I think all our moms told us when we were young that two wrongs don’t make a right. What I have been told about signal timing is this: The lights were timed/synchronized, and whoever synchronized them apparently didn’t read the box. They need to be resynchronized regularly or they drift out of synch. No one realized this. I’ve been told, for a while, that the lights are to be resynchronized and now they know that they need to keep on top of it. I don’t know what the hold up is on getting it down though, one might assume $$$. Waterman heading up the hill functions fine with only two lanes, I don’t think the traffic flow will come to a halt if Thomas Street doesn’t have a right turn lane. At most the right turn lane accommodates 3 cars. Traffic would still be allowed to turn right on red, they would simply have to do it from one of two lanes, not one of three. My big problem with right on red is again, a matter of driver behavior (and while I’m harshing on drivers don’t take that to mean that I absolve pedestrians of responsibility on the road). Not just here, but all over the city, drivers turn right on red without looking right. It’s crazy, but people look left while turning right and never look right to ensure they aren’t about to run over anything/one. I think part of the reason is that as a city we are small, and most of our drivers really aren’t urban drivers. Make a right on red on Route 2 there’s really no reason to look right, there’s no pedestrians. Drivers maintain that mentality in the city. The other issue that I want the diet to solve, is the width of space that pedestrians need to cross at the bottom of the hill. Alger points out that the traffic island was removed at the top of the hill, making the street much wider. Basically, if you get to the curb more than 2 seconds after the light turns red, the walk light is already flashing don’t walk and you really have to think if you’re going to be able to make it across all three lanes. The other issue is the walk light starts flashing way too soon. It goes solid don’t walk way before the light actually turns green. I constantly stand there like a moron with the traffic stopped wondering if I still have time to cross. Reduce the width of the street, and increase the length of the walk signal and pedestrians feel less of a need to jaywalk. Pedestrian signalization is as much of a problem as traffic light synchronization really, and probably needs it’s own post. For the reasons mentioned against, the diet should probably have to wait until the traffic problems at the mixing bowl are addressed. Problems which include signal synchronization, and enforcement of box blocking. If the diet were to happen, I would advocate creating a temporary diet and assessing how it affects area traffic patterns before making it permanent. Whew, that’s a long comment!